WBA Super and IBF champion Amir Khan came face to face with No1 contender Lamont Peterson for the first time in London earlier this week to announce their December 10 title fight. Scheduled for Peterson’s hometown of Washington DC, it will be the third time that Khan has fought Stateside and the contest is expected to be the last time he fights at 140lbs before stepping up to welterweight to set up a mega-fight against unbeaten Floyd Mayweather next summer. Although the Brit was keen to stress that he is solely focused on Peterson and the task at hand. ‘I have ambitions and one of them is to fight Floyd Mayweather and beat him, but I have got Lamont Peterson to beat first,’ said Khan. Peterson who also only has one loss on his record, to Khan’s rival Timothy Bradley, shared the champions sentiments about not overlooking the upcoming contest while also vowing to come and fight. ‘We both know what it feels like to lose and we definitely don't want to lose again,’ said Peterson. ‘We both want to win this fight badly. 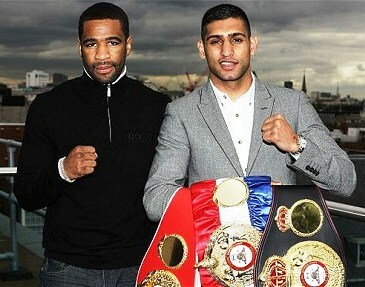 Lamont Peterson and Barry King were a dynamic duo who hit London's finest Mayfair Hotel for the first press conference yesterday to announce their fight with Amir Khan on 10th December 2011. Now they are already on their way back to Washington DC to continue the 2nd leg of the tour with Team Khan and Richard Schaefer and the second part will continue tomorrow in Washington. The media room was classy and stylish and had an ambient mood and welcomed in the officials Asif Vali, who is Amir Khan's business manager and Richard Schaefer who is the CEO of Golden Boy Boxing, sat alongside was Amir Khan, Lamont Peterson and Barry King manager and trainer of Peterson. Khan will defend the WBA and IBF light-welterweight world titles at the Washington Convention Centre in December on the home turf of Peterson, Richard Schaefer disclosed the location and said that the event will be shown on HBO in the US, with the convention centre set up for a capacity of 12,000. He said about Amir Khan, "He has become the face of boxing in the United Kingdom and he has captured the attention of the fans in the United States in a short space of time." It's not yet apparent whether Khan's management will remain with pay-per-view channel Primetime or switch back to Sky Sports after the dispute during the Mccloskey fight in April. Regardless he is a fighter that the public will pay to see and he is in demand and this fight is something they will not miss, with all the support of the fans and the boxing world Amir Khan will yet again be a date scribbled in on people's diary. Amir Khan said in the press conference "I leave for Los Angeles next week and training camp with Freddie Roach, who has cut short the camp with Manny Pacquiao in the Philippines to fit me into the plans, I will need to be at my best against Lamont. He can box he can stand and fight, and he's being put down in fights but he shown, like me he has a lion;s heart. This will be a tough fight for me but I will have a strategy to get through it." Barry King also talked about Lamont having strategy I asked him if there was going to be any different techniques that they were going to be bringing to this fight without giving away the game plan as he had problems in the past and also that Amir Khan has improved a lot in these last couple of years, his reaction was and he also comended that Amir had improved and said "Amir has improved and so has Lamont and the biggest improvement with Lamont was after the Bradley and Ortiz fight and he has become more strategic and he made an adjustment." Peterson is a pleasing and pleasant person even though he had a really awful upbringing he likes numeracy and he would like to educate himself in college possibly after he retires as he thinks it was a gift to him at a young age. I asked him what plans he had with regard to his training as it was only 8 weeks away and where would it be in a secret location? He said "I'll be training at home as it will be in DC and he I don't have to be going anywhere to train, I wont be staying at home I probably be at where nobody knows and just show up at the gym and work hard like I always do and not going to change too much and find the strategy that me and my coach will work on and the conditioning will probably not change that much." Amir Khan on the other had a lot of matters to deal with at this press conference even though it is one fight with Peterson, his career for the next year is mapped out as the press conference was developing, his fight against Mayweather was agreed by Mayweather and talks were going ahead, so this young superstar had an abundant proposed objective waiting for him after the Peterson fight in Washington. He told me that he 8 week's training was sufficient and the climate in Washington would be more or less the same as in the UK and that they will leave L.A around ten days before the fight and said he does feel the pressure however he loves being in the Wild Card Gym and being put through the paces by Freddie Roach. You can watch the full press conference and more of these interviews with Lamont Peterson and Amir Khan on the following links.